Every day most of us get up in the morning, fix ourselves breakfast and think, “What shall we have for dinner tonight.” But for many, waking up brings the thought, “Will I have any food to eat today? Where will I find food? 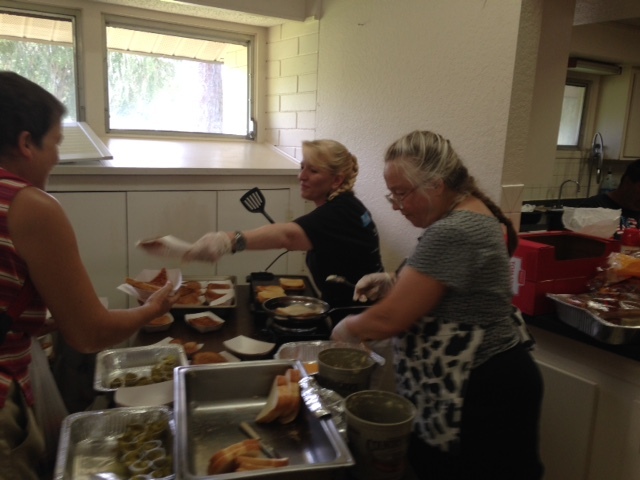 How will I feed my children?” In northeast Ocala, Florida, Gateway to Hope Ministries provides the answer. The people we serve work hard to take care of themselves and their families. They are devoted mothers and fathers, daughters and sons, grandmothers and grandfathers. They include the working poor, the unemployed, the elderly, the disabled and the homeless. According to a January 2011 Marion County Homeless Coalition Point-in-Time Survey, 71.2% of homeless people had been residents for at least one year prior to becoming homeless. Of those counted, 53% stated that they were homeless for the very first time ever. These are individuals who have been devastated by the economic crisis. These are individuals who, with some help, can get back on their feet. Furthermore, according to the same study, 44% have at least one disabling condition and, sadly, 26.6% of people living on the streets or in emergency shelters were households with minor children. At the time of the survey, of the 311 people staying in emergency shelters, 53 people (17%) were children under the age of 17. The 2011 Council on Homelessness Report states that 1,691 homeless students resided in Marion County during the 2009-2010 school years, while the 2010 U.S. Census revealed that 28% of our children aged 5-17 were living in poverty. Over the past year, Gateway has seen a significant increase in the numbers of families with children, many headed by single mothers, and families who are homeless. Approximately one third of the people we serve are disabled. Almost half of the families using our food pantry are classified as homeless, meaning that they are either living on the streets, living with friends or family, or living in some form of shelter. Gateway’s goal is not to be a long-term resource for someone but, rather, to provide all the resources that individuals need so they can return to being self-sufficient, employed, with housing and able to take care of themselves. Many of those who come to us have lost hope. Our goal is to restore that hope. Gateway to Hope Ministries is a 501C-3 Non Profit Christ Based Ministry that is dedicated to serving the needs of the homeless, needy, underprivileged, frail, elderly, working poor, or anyone in need in the Greater Ocala area.